Buyers in Vietnam’s polyolefin markets are said to be largely inactive this week as most are anticipating further downward movement in prices given ongoing losses in crude oil and naphtha markets, according to ChemOrbis. Prices for locally-held materials have edged downward on the week while import prices are largely unchanged from the past week as sellers are generally reluctant to agree to further decreases after markets had shown some signs of stabilizing in late December before the recent down turn in energy markets. Upstream, crude oil futures on the NYMEX dipped below the $50/barrel threshold while Brent futures moved close to the $51/barrel level, bringing crude oil prices to the lowest levels seen since 2009. 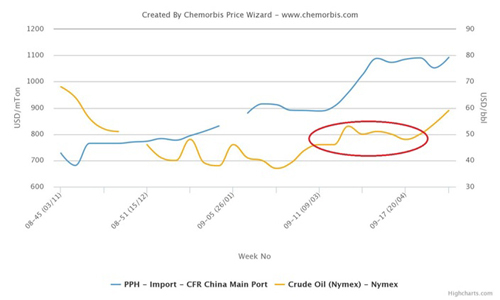 In line with the decline in crude oil prices, spot naphtha prices on a CFR Japan basis dropped beneath the $450/ton threshold to hit their lowest levels since May 2009, according to data from ChemOrbis Price Wizard. A Thai producer reported maintaining their PP and HDPE prices to the Vietnamese market following the New Year holidays. “Buyers are placing bids well below our current offer levels and we have not been able to conclude many deals recently. Based on the prevailing upstream costs, we believe that it will be difficult to maintain prices at their current levels in the weeks ahead,” a producer source commented. A Southeast Asian producer also reported maintaining their LDPE and HDPE prices to Vietnam on the week while complaining that deals are scarce as most buyers are keeping to the sidelines in anticipation of further price reductions. A trader said that prices for both PP and PE were largely unchanged in the local market. “We believe that crude oil prices on the NYMEX will drop to around $45/barrel before stabilizing and we are therefore planning to wait a while longer before replenishing our stocks,” the trader stated. 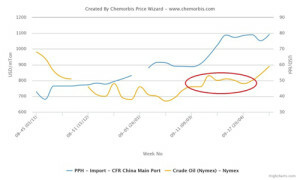 According to ChemOrbis, a converter manufacturing plastic containers said that they received offers for Saudi Arabian PP and Southeast Asian HDPE blow moulding at prices near the low end of the import ranges, while adding that they are not interested in purchasing as they expect to see further price reductions in the days ahead based on softer energy costs. A plastic bag manufacturer who received offers for locally-held Saudi Arabian LLDPE and HDPE film stated, “Prices have not changed much for the past two weeks in the local market, but we expect to see some renewed downward movement given the recent reductions in crude oil prices.